ASTC Recruitment 2017 for 4 Nos. Junior Engineers (Civil) Posts: Walk-In-Interview on 05-07-2017. - Jobs4NE : Jobs in Assam and North East India. ASTC Recruitment 2017 for 4 Nos. Junior Engineers (Civil) Posts: Walk-In-Interview on 05-07-2017. Walk-In-Interview for engagement of 4 (four) Nos. 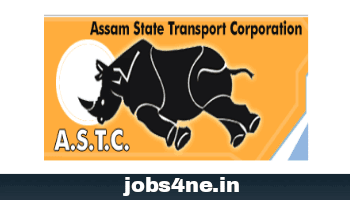 Junior Engineers (Civil), on Contract Basis for a period of 11 (Eleven) months only against various projects of Assam State Transport Corporation within the State of Assam will be held on 05-07-2017. Date & Time of Walk-In-Interview: 05-07-2017 at 10.30 am. Venue of Walk-In-Interview: Office of the Managing Director, A. S.T. Corporation, Guwahati. Name of the post: Junior Engineers (Civil). Total no. of post: 04 Nos. Educational Qualification: 3 (Three) years Diploma in Civil Engineering from any recognised institute. Age Limit: Must not be less than 18 (Eighteen) years and more than 43 (Forty three) years as on 01.07.2017. Upper age relaxable as per Government norms for the candidates belong to SC/ ST/ OBC & MOBC. Experience: Minimum 1(one) year working experience as Site Engineer in respective field. How to Apply: Interested eligible Indian citizens may appear in the said Walk-In-Interview as scheduled along with bio-data, original testimonials and a passport size photograph.